At Salem College in Winston-Salem, NC, Lister-Sink designed and directs the U.S.’s first master’s degree program in piano or organ performance and pedagogy with an emphasis on injury-preventive keyboard technique. The school also offers a professional graduate certificate for performers or students in gap years and college teachers on sabbatical. 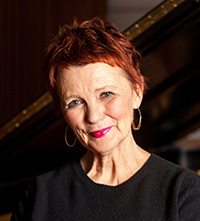 proven when Lister-Sink became keyboardist with Amsterdam’s Concertgebouw Orchestra in the 1970s; she also served on the Eastman School of Music faculty, from 1979–1986. Lister-Sink’s 1996 video/DVD Freeing the Caged Bird—Developing Well-Coordinated, Injury-Preventive Piano Technique has sold more than 15,000 copies. “My method is for teaching principals of good coordination,” she says. “Musicians need to have the body awareness of athletes. Great athletes learn complex motor skills in a step-by-step manner, and the same is true of great musicians.” Two of her all-time models of healthy keyboard technique are Arthur Rubinstein and Van Cliburn.